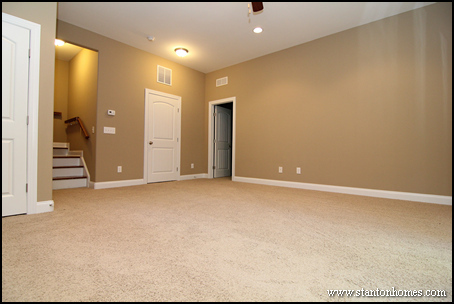 Which is a better investment, a basement or a bonus room? 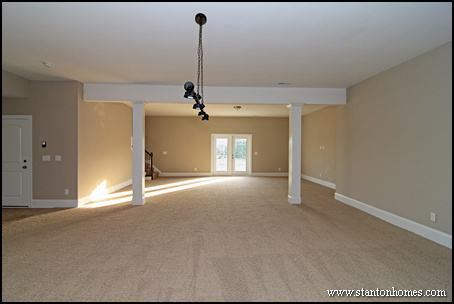 What should I choose - a basement, or a bonus room? A common home buyer question is, "is a basement home a better long-term investment than a bonus room home?" We've got answers - and photos of popular designs - below. 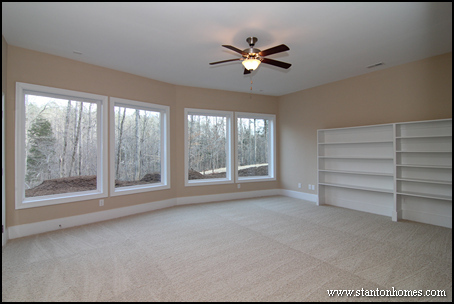 If the bonus room is already drawn on the plan but noted as "unfinished", finishing that bonus room is almost always the most cost effective way to add a few hundred square feet or more to your home. 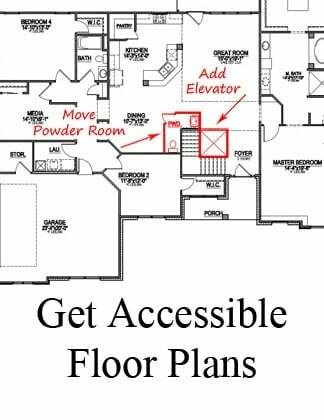 If there is not already a bonus room drawn on the floor plan, there are a few ways to add one. 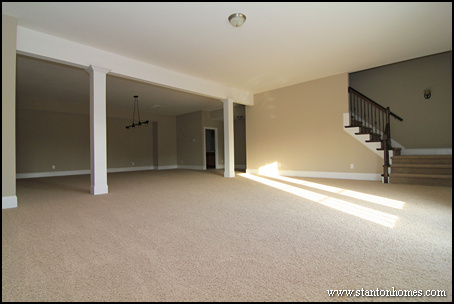 Does the plan show a vaulted or two story great room or family room? If so, it's easy to add a bonus room over the family room, and reduce the height of the family room ceiling. Not only is this a cost effective way to add additional heated space, it will also increase the energy efficiency of your new home. Your HVAC system works harder to heat and cool a vaulted or two story room, and all those extra windows let in a larger proportion of heat (or cold). Still want some extra height in your Great Room, but want that bonus room too? In many cases, a bonus room can be designed with a "step up" floor, which means your Great Room can have a 10' or 11' ceiling if the rest of the first floor has a 9' ceiling. Do you enjoy soaring ceilings, or the possibility of two full stories of windows? 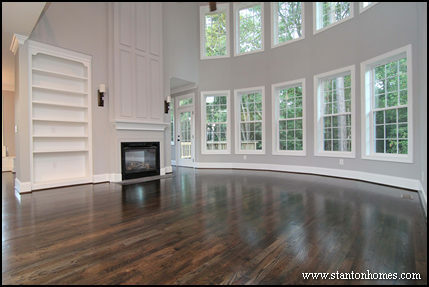 If so, adding a bonus room over the great room might not be the best option for you. 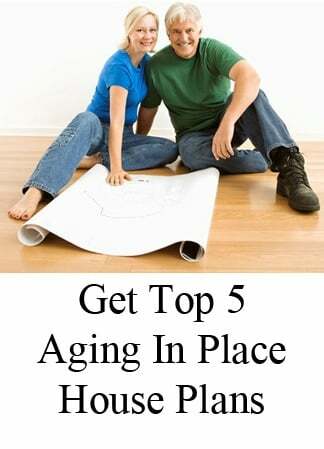 But you might want to consider adding bonus space in the basement! Basements are a great option for any sloped lot. A daylight basement can add extremely cost effective square footage to your home - imagine what you can do with an extra 1400, 1600, or 2000 or more sq ft of living space! An unfinished daylight basement can be added at an extremely low cost per sq ft. Most homeowners opt for an unfinished basement, that they can do more with, later, in order to keep costs lower upfront. A typical daylight basement can add additional bedroom space, a huge Recreation Room, spacious office, and extensive storage space to your new home. Ask your builder about the impact of adding a future bath in the lower level, if you're opting to finish the basement at another time. 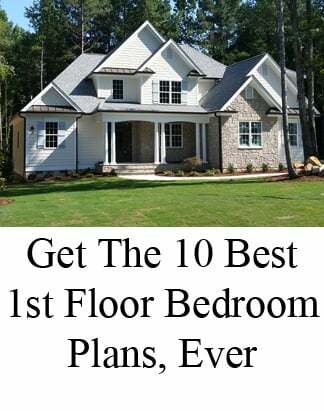 Below are three of our most popular daylight basement home design approaches - to show what it can look like to add bedrooms, bathrooms, recreation rooms, storage, and built-ins to all the space created by a basement. 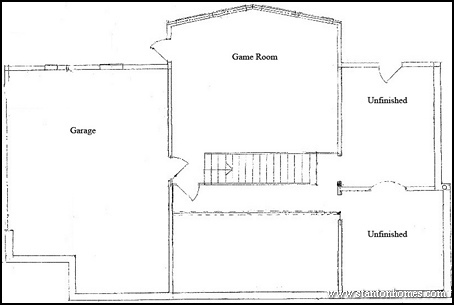 Pictured here is a basement floor plan designed with two distinct spaces in mind: a pool table area in the recreation room and a media and lounge area divided by columns. This basement layout includes a full bathroom - a feature chosen to give this basement more livable space. Adding a bathroom can accommodate all kinds of future private living space for kids as they grow older, or potential long-term guests. French doors provide direct access to outdoor living spaces. The hanging light marks the location of the pool table, arriving shortly! Pictured here is a basement living room, with doors to dual bedrooms, baths, and a laundry room. Imagine the possibilities, for all this open space. Pictured here is a basement designed as an entertainment and hang out area. Whether it morphs into a "man cave" or spread out activities for family hang out time, there's a lot of ways to use this room. French doors lead to outdoor living space. This design, a version of the Treehouse, allows for tons of storage space - finished or unfinished. Ask the builder for more ways to put a bonus into your new home - top or bottom, there are a lot of ways to build in space for everything your family wants to do. Click here to learn more about Superior Wall Systems for basements - use for Raleigh daylight basement homes. 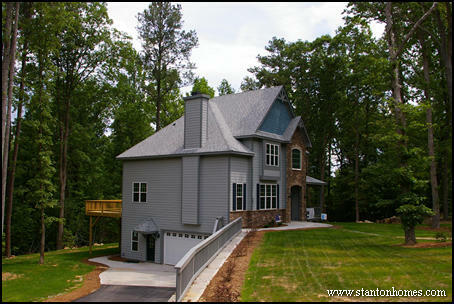 How much does a basement home cost to build in Raleigh, NC? 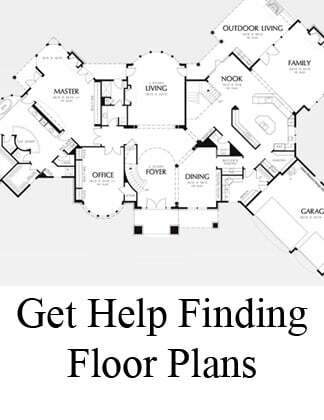 Floor plans offer more flexibility than you might think. 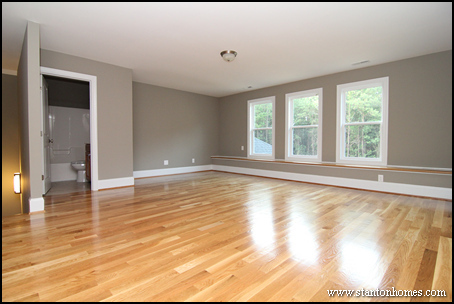 Below are photos taken in two version of the Summerlyn, a floor plan concept by Frank Betz. In these examples, see how to add square footage to a house by adding a second story bonus room. 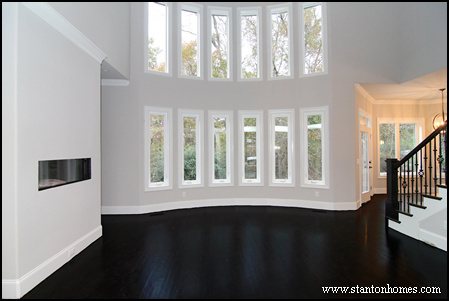 In this version of the Summerlyn, the home owners wanted to customize their floor plan that included a large, open concept great room with a two story wall of windows. They asked us to incorporate special feature to highlight the dramatic ceiling height, including a large built-in bookcase for extra storage space, full-height picture frame paneling above the two-sided fireplace, and second story overlook. Get a floor plan and price for this version of the Summerlyn - click here. Home buyers are often interested in how to add square footage to a house for the lowest cost possible. 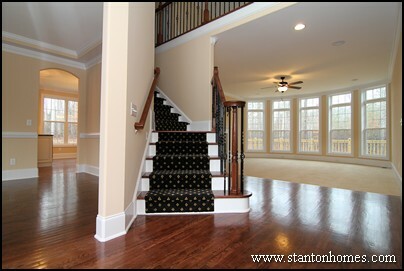 Integrating a bonus room in place of a Two Story Great Room is a popular option. In another version of the Summerlyn, the home owners asked us to add a second story bonus room above the great room, to cost effectively maximize their living space in their new custom home. 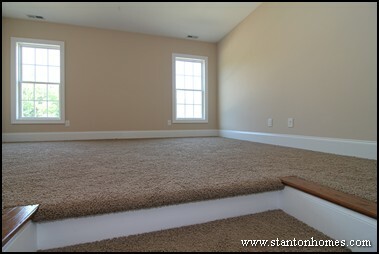 Upstairs, the bonus room included a second story overlook. Downstairs, we added a row of transom windows to keep the great room light, open, and inviting - the open concept floor plan maintained its appeal.